Welcome to Sneak Peek Sunday! This is a fun little hop where readers can visit authors' blogs and read short snippets of various books. Some are works in progress, some are published. Regardless there's pretty much something for everyone. Today's snippet fast forwards to later that evening. Lucas is sitting with Avery after he helps someone bring her drunk sister back to the house. Lucas wants more than anything to make things right and so he tires to talk to Avery. Of course, Avery is pretty weary about letting herself get lost in Lucas's touch again after what she found out, but she can't help her feelings. Here's the snippet! “If I let you hold me, I-” I lose control. I want you all over again. I abandon all of my senses and have so many dangerous thoughts when it comes to you. “Talk to me, Avery.” Lucas prodded gently, pulling her to him. Avery gave in, resting her head against his chest. His arms closed around her, providing a cocoon. How is it she felt so good right then, when just before she couldn’t decide how she felt? He ran his hand up and down her back in soft, tender motions. Avery shuddered, and a snake of chills traveled down her spine. Avery stayed silent, letting the words sink in. He sounded sincere enough. “Avery. Look at me for a minute,” Lucas pleaded. She complied, staring up at his face. The emotion in his eyes made her heart beat faster. No fooling, I have a contest. I need a bit of help. Contrary to popular belief, I can be helped. So, what is this contest and how can you help me, you ask? I'm in need of title help. My first two books have had fairly unique and original titles. Now, I know I can't do this with all of my books, because I do have a few titles in mind that have been used, but fit the story. Still, for Love and Music in Texas Book 2's case, I want something original and unique. We've got The Secret Santa Wishing Well, and Baby Stetson as my already released books. Love each title, and they fit the story. 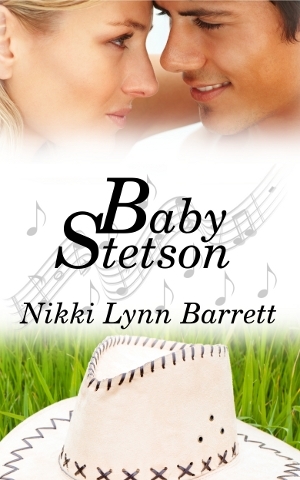 Book two features Jameson and Melody as the couple, and yes, readers get more of Lucas and Avery, and of course, more with the band Baby Stetson. I don't have a blurb of course, as the book is only 7000 words in but I'll give you a bit of a run down. Melody is a woman on the run. Trying to help a woman she met on the bus, they get off in Harmony's Echo, Texas. But that's not far enough away for Melody, who has a lot to hide. That's where she meets Jameson, and he helps her out as best he can, even though he doesn't know what she's running from. Jameson is dealing with his own demons. The one year anniversary of his father's death is coming up, and his mom isn't doing too well handling it. And even though he's happy for his best friend Avery, it's still hard for him to see her with someone else when for the longest time, his dreams revolved around making music and living a happy life with Avery, until one stupid mistake changed all that. There will also be some things Avery and Lucas have to deal with, and it all ties together. So, I need unique title help! What do you get out of it? Well, of course, the fact that you're helping an author out. If your title is chosen, you'll win a $25 gift card to the book retailer of your choice, you'll be acknowledged, and when Love and Music in Texas Book 2 comes out, you get an autographed copy. You can make your suggestions in the comments section, and yes, you can make more than one. I can't wait to see your suggestions. Ready, set, start naming!